(CNN) -- A United Nations aid agency whose supply lines have been cut off couldn't help Gaza residents seeking humanitarian assistance Saturday, U.N. spokesman Chris Gunness said. 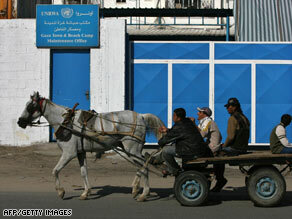 Palestinians ride past the closed doors of a United Nations relief agency facility Saturday in Gaza City. Because of rocket attacks and other clashes, Israel sealed its border with Gaza on November 5, rendering the U.N. Relief and Works Agency unable to replenish storage facilities. They ran out on Friday. "We have run out of food. Our warehouses are empty," UNRWA Director John Ging told CNN on Friday. It was not immediately clear how many people were turned away Saturday. Israeli Prime Minister Ehud Olmert said the Israeli government considers the rocket attacks from Gaza "a fundamental and blunt violation of the understandings that led to the calm," according to a written statement on Friday. "As soon as there is a period of calm, we need to get as many resources in as possible," the U.N.'s Gunness said Saturday. Israel temporarily opened border crossings on Monday and Tuesday to deliver 600,000 liters (159,000 gallons) of diesel fuel to Gaza, Israeli spokesman Peter Lerner said. He said security threats disrupted Israeli plans to reopen the crossings on Thursday, but said authorities are considering a reopening on Sunday. The Israeli government has denied that its actions have interfered with UNRWA's ability to provide assistance to some 80 percent of Gaza's 1.5 million people. But U.N. Secretary-General Ban Ki-moon called on Israel "to allow urgently, the steady and sufficient supply of fuel and humanitarian assistance," according to a statement from the U.N. chief's spokesman. "(Ban) also calls on Israel to resume facilitating the activities of (UNRWA) ... and all humanitarian agencies, including through unimpeded access for U.N. officials and humanitarian workers," the spokesman's statement said. Olmert and Palestinian President Mahmoud Abbas are scheduled to meet on Monday to discuss a potential cease-fire. The Israeli military carried out an airstrike on a suspected militant rocket-launching site in northern Gaza early Friday, an Israel Defense Forces spokesman said. Five militants were wounded, Palestinian security forces said. CNN's Kevin Flower and Paul Colsey contributed to this report.